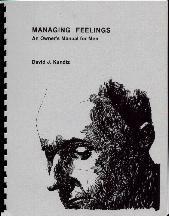 The Menstuff® library lists pertinent books concerning various feelings including anger,assertiveness, depression, fear, forgiveness, general, grief, joy, loneliness and shame, which are listed separately. 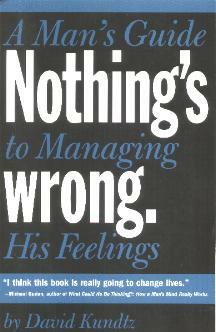 See also issues, books anger, assertiveness, depression, fear, forgiveness, grief, joy, lonliness, shame. Allen, Marvin, In the Company of Men: A new approach to healing for husbands, fathers & friends. This book throws out a challenge to all thinking and feeling men - a challenge to redefine their masculinity. The author has met this challenge in his own life - as a son, husband, and father who confronted his own wounds; as a nationally known therapist specializing in men's problems; as the leader of acclaimed men's gatherings. Now, with this book, the author outlines a new breakthrough approach to male healing that all men can use to fulfill themselves in love relationships, with their families, and at the workplace. He arrived at his insights into the male psyche the hard way: by living them. The son of an abusive father and a controlling mother, he got trapped in a loveless marriage and a round-the-clock work schedule. Eventually, the stress became so intense that he had no alternative but therapy, but he discovered, as so many men do, that traditional "talk therapy" failed to tap the grief and rage pent up inside him. It wasn't until he became a therapist himself and saw many male clients struggle with the same problems he had that he hit on his radical new techniques for treating men - techniques that encourage men not simply to discuss their emotions but to release them in the healing company of other men. This book takes the readers inside his dynamic group-therapy sessions and Wildman Gatherings and dramatizes exactly how this new male therapy works. Drawing on the true stories of scores of men, he identifies key categories of dysfunctional parents and shows how each category creates a different type of psychological trap for men. He explores how the media, cultural institutions, work pressures and peer groups reinforce male gender conditioning in their relationships with women, destroy themselves at work, and abuse their minds and bodies with drugs and alcohol. Random House, 1993 ISBN 0-679-42287-0 Buy This Book! Brody, Leslie, Gender, Emotion and the Family. Do women express their feelings more than men? Popular stereotypes say they do, but in this provocative book, the author breaks with conventional wisdom. Integrating a wealth of perspectives and research, biological, sociocultural, developmental, her work explores the nature and extent of gender differences in emotional expression, as well as the endlessly complex question of how such differences come about. Nurture, far more than nature, emerges here as the stronger force in fashioning gender differences in emotional expression. The author shows that whether and how men and womn express their feelings varies widely from situation to situation and from culture to culture, and depends on a number of particular characteristics including age, ethnicity, cultural background, power and status. Especially pertinent is the oragnization of the family, in which boys and girls elicit and absorb different emotional strategies. The author also examines the important of gender roles, whether in the family, the peer group, or the culture at large, and the various patterns of emotional expression used to adapt to power and status imbalances. Lucid and level-headed, this book offers an unusually rich and nuanced pictures of the great range of male and female emotional styles, and the variety of the human character. Harvard University Press www.hup.harvard.edu 1999 ISBN 0-674-341864 Buy This Book! Curtis, Jamie Lee, Today I Feel Silly & Other Moods that Make My Day. Silly, cranky, excited or sad - everyone has moods that can change each day. This zany, touching verse, paried with whimsical and original illustrations, helps kids explore, identify and even have fun with their ever-changing moods. Previous best sellers by the author are Tell me Again About the Night I was Born (for adopted children) and When I Was Little: A Four-Year-Old's Memoir of Her Youth. Joanna Cotler Books 1998 Buy This Book! Ellis, Albert, Feeling Better, Getting Better, Staying Better: Profound self-help therapy for your emotions. Panic. Depression. Rage. Self-pity. How can you function well and live happily under such heavy emotional burdens? According to the author, a world-renouwned psychologist, the first step to a healthier perspective is to recognize that your own dogmatic beliefs and behavior fuel your upsets. The author calls the process of turning adversitites into intolerable situations catastrophizing. When you irrationally exacerbate your misfortunes, you seek ways of feeling better fast. Maybe you try relaxation techniques. Maybe you keep yourself busy, socialize more, exercise, or even indulge in alcohol or drugs. Too often, these "quick fixes" only work temporarily, distracting you without actually helping you get better. Wouldn't you rather be permanently less depressable, even when very strong adversities occur in your life? In this book, he draws on his 50 years of experiences as a psychotherapist to offer sensible, inspiring advice for lasting self-improvement. Long acclaimed for his development of Rational Emotive Behavior Therapy (REBT), he encourages a proactive approach to life's setbacks. In this book is offered detailed examples, practical exercises, and warm wisdom for gaining and maintaining emotional well-being. Impact Publishers, www.impactpublishers.com 2001 ISBN 1-886230-35-8 Buy This Book! 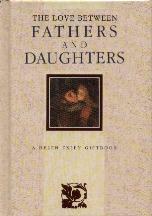 Exley, Helen, The Love Between Fathers and Daughters. "I know I have my father wrapped around my little finger, but he has me wrapped around his," says Holly, the daughter of Charlton Heston. This beautiful collection celebrates the magical bond between fathers and their daughters. It's the perfect gift from one to the other. Exley Publications, 1995 ISBN 1-85015-643-3 Buy This Book! 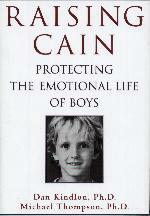 Kindlon, Dan & Michael Thompson, Raising Cain: Protecting the emotional life of boys. Two the the nation's leading psychologists share what they have learned in more than thirty-five years of combined expeirnece working with boys and their families. They reveal a nationa of boys who are hurting - sad, afraid, angry and silent. Statistics point to an alarming number of young boys at high risk for suicide, alcohol and drug abuse, violence and loneliness. The crucial question: What do boys need that they're not getting? They illuminate the forces that threaten our boys, teaching them to believe that "cool" equals macho strength and stoicism. Cutting through outdated theories of "mother blame", "boy biology" and "testosterone", they shed light on the destructive emotional training our boys receive - the emotional miseducation of boys. They paint a portrait of boys systematically steered away from their eomotional lives by adults and the peer ("culture of cruelty") boys, who receive little encouragement to develop qualities such as compassion, sensitivity, and warmth. The good news is that this doesn't have to happen. They identify the social and emotional challenges that boys encounter in school and show how parents can help boys cultivate emotional awareness and empathy - giving them the vital connections and support they need to navigate the social pressures of youth (and eliminate the No Fear culture - ed.) Ballantine Books www.randomhouse.com/BB/ 1999 ISBN 0-345-42457-2 Buy This Book! McLaren , Karla, Emotional Genius: Discovering the deepest language of the soul. All of your emotions - especially your strongest and most difficult feelings - are storehouses of unlimited energy. For instance, your rage can give you superhuman strength, your fear can save you from certain death, and your shame and depression can bring you to a complete (and often necessary) halt. Imagine what you could accomplish if - instead of repressing your emotions and losing your energy or expressing them haphazardly and losing your way - you could marshal their energies and use them to increase your awareness, heal your relationships, and address your deepest wounds. In her groundbreaking new work, the author leads us on a step-by-step journey out of emotional confusion and suffering, and helps us discover our soul's deepest language and our own innate Emotional Genius. Laughing Tree Press, www.emovere.com, 2001, ISBN 0-9656583-4-1 Buy This Book! Shields, Stephanie A., Speaking from the Heart: Gender and the social meaning of emotion. Who gets called "emotional?" And what does it mean when that happens? What tells us that a person is "speaking from the heart?" The prevailing stereotype is that she is emotional, while he is not. In this book, the author draws on examples from everyday life, contemporary culture, and the latest research, to reveal how culturally shared beliefs about emotion shape our identities as women and men. This fascinating exploration of gender and emotion in a clear and engaging style takes up topics as diverse as nineteenth-century ideals of womanhood, weeping politicians, children's play, and the Superbowl. It is essential reading for anyone interested in the way emotion affects our everyday lives. Cambridge University Press, www.cambridge.org, 2002. ISBN 0-521-80297-0 Buy This Book! Smith, Rachel, Winnie the Pooh: Feelings. With the help of his friends from the Hundred-Acre Wood, Pooh explores feelings from happy to gloomy, from excited to shy. Beautifully illustrated by Mark Marderosian. Disney Books, www.DisneyBooks.com, 2000, ISBN 0-7364-1008-2 Buy This Book!